Day 3 Continued: Cookies,Cake,Cupcakes, and a Pinata?! 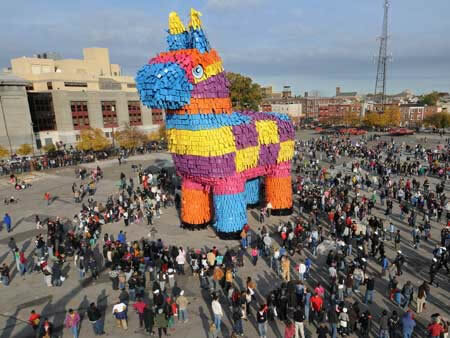 Now that is one big pinata! I have a confession to make. I did have some cookies yesterday. I can’t lie to my readers. With that said, I just left another BBQ and did not eat any of the sweets they had. I did unfortunately eat some cheese doodles, but I managed to not taste any of the numerous desserts they had laid out. It was a Memorial Day BBQ/ Birthday party, so as you can imagine I was surrounded by a lot of cake and cookies. Once the pinata came out I knew I had to get out of that place fast. I heard the smashing and scattering of the candy fall to the ground as I ran to the car. Hopefully I will be stronger as the days go on. But, for now to play it safe, I need to remove myself from situations like that. I was able to keep track of my sugar intake for half the day, not sure how the cheese doodles affected it.. I was around 20 Grams before I ate those. Here’s to doing better tomorrow!